Tre Ford has been named the Ontario University Athletics’ (OUA) MVP and he adds this top individual to an already growing trophy cabinet, which also includes the OUA’s top freshman he received last year. In achieving this accolade, Ford joins an exclusive list of previous Warriors, which includes Tom Chartier, Jarret Smith and Mike Bradley. The overwhelming empirical evidence at hand suggests that Ford was indeed the best player in OUA Football this season. He completed a total of 27 touchdown passes, the highest in OUA for this season. He covered a total distance of 2822 yards in passing yards, another high for the season. Not only that, his pass completion percentage of 74.1 is the new OUA single-season record. On top of all this, he had the fewest interceptions (2) amongst qualified passers. And despite being in the quarterback position, Ford covered a total of 641 yards whilst rushing. Moving away from the cumulative season statistics, his statistics in separate games were as impressive as his statistics for the season, if not more. He set multiple records in Warriors football history. The first of which was that when he completed 25 out of 28 passes for 463 yards and 6 touchdowns, and additionally he completed 58 yards and a touchdown on the ground. It only took him a few weeks to break his own records as he completed 472 yards and contributed to three touchdowns with his immaculate passing. 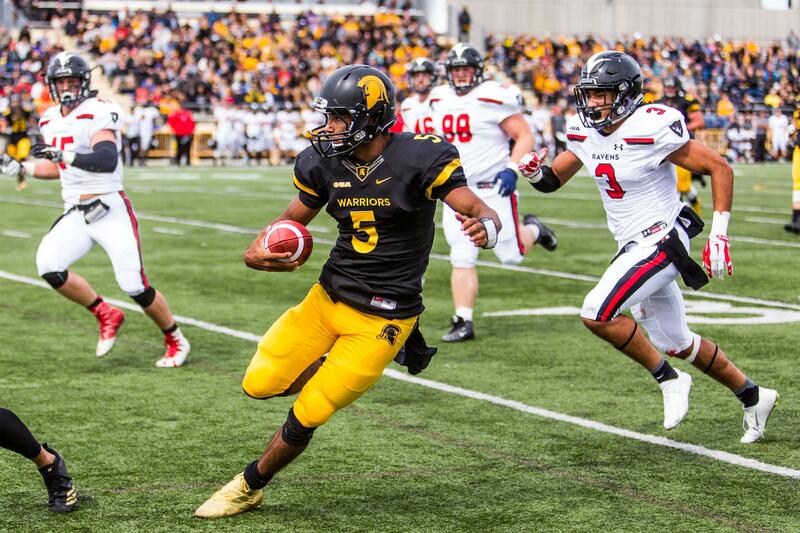 And he delivered this game-defining performance against Laurier Golden Hawks, in the process leading Warriors to historic win – for the firs time in 15 years – in the battle of Waterloo. If we look at OUA football history in general, then, in terms of passing, Ford’s season with Warriors will undoubtedly go down as one of the best seasons. He formed a prodigious partnership with Tyler Ternowski as both of them combined for a total of 14 touchdowns. And if one was to look at the key factor which helped Warriors to a first post-season since 2003, it will be this combination of Ford and Ternowski. In fact, not only that, Ford also helps make his teammates better, as six members, including Ford and Ternowski, of the Warriors earned OUA all-star selections. Warriors did not just have Ford selected for MVP, but Ford passed his mantle as the rookie of the year to another Warrior, Jack Hinsperger. Hinsperger, a first-year linebacker, has impressed since joining the Warriors football team. Hinsperger came to Warriors with a lot of excitment surrounding his defensive ability, and he has lived up to his billing. He had the second highest tackles on the team, with 4.6 tackles, 2.5 sacks and one fumble recovery per game. And given the fact that he missed games due to injury, those are some impressive statistics indeed. It took just two games to announce his arrival on the big stage as in his second game with the Warriors against Toronto Varsity Blues, he led the team with 5.5 tackles and had 1.5 sacks. In week six of the season against York, he injured himself and subsequently missed the last two games in regular season. He returned in the playoff loss against Guelph and he proved to be one of the best players in that game as he contributed 8 tackles in the post-season game of his career. In winning the Norm Marshall (rookie of the season) trophy, he joins the elite list of Warriors who have won this accolade. Other athletes in that list include Jordan Verdone and Ford. Hinsperger has been a revelation this season for the Warriors and he follows in the footsteps of Ford with the potential to become a future superstar for the Warriors. And the acquisition of both these powerhouses speaks volumes about the effectiveness of Warriors’ recruitment program. It does not matter if Warriors did not win the championship this season, because, if anything, the fact that University of Waterloo has become such an attractive destination for young promising athletes means that Warriors are building a formidable team for the future. And that team will be capable of achieving greatness and defining an era. The immediate next step for both these stars are national accolades, as by virtue of their provincial awards, Ford is nominated for Hec Crighton Trophy and Hinsperger is nominated for the Peter Gorman Trophy. If Ford is able to attain the Hec Crighton Trophy, given to the nation’s most outstanding player, he will become the first Warrior in history to get that accolade.On Nov. 24th, we can potentially see both these precocious talents getting recognition for their talents. Protect your Tech this Winter!